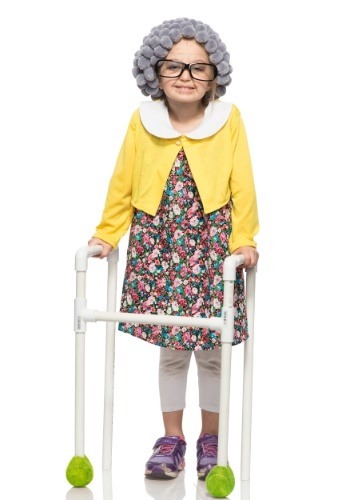 When you ask your child what she wants to be when she grows up, does she reply, "elderly"? If so, she must be a pretty smart cookie. Those folks in the home know what's up. Those Grandmas and Grandpas have lived through an age without internet if you wanted to bake a cake you'd look in a cookbook. If you wanted someone's phone number you'd look in a phone book. When they went to the Grand Canyon for their honeymoon they didn't take a selfie stick, they asked a stranger to take their picture. They took chances, made mistakes, and now they can tell us young whipper snappers their hard earned opinions on everything from the weather to that sweater you're wearing. When your child puts on her gray curls she knows she's putting on the wig of wisdom, the right to say, "You kids get off my lawn!". In her darling yellow sweater, your child will be ready for that bridge tournament she signed up for last month. Have patience when you're driving to the senior center and she keeps telling you to slow down. You'll get there three times slower than usual, but at least she's in character. Ethel and Mortie will probably save a spot for her at their table, anyway, they know she's a contender, she's always holding a good hand. Sure, your girl has always been an old soul but it's a little alarming how fast she's growing up. She's always had an affinity for hitting up early bird specials and trading canning methods, but not until recently did she start stealing your brow liner to draw wrinkles on her face. You've tried to get her to act her age long enough, it's time you accepted her gray-haired ways. It's not all bad, once she fully gets into character, you'll be able to take advantage of that senior citizen discount all over town!